Last year, Amitabh Bachchan created ripples across the advertisement world when he shared that he has stopped promoting Pepsi, because of a young girl: She asked him why is he helping to sell Pepsi when her school teacher has said that soft drinks are poison? In this rare case, the moral conscience of a senior actor stopped him from selling a product which is harmful for young children, and serves no purpose to them besides making them overweight and prone to diabetes at an early age. But often celebrities and brands avoid this moral dilemma, and solely focus on creating an overhyped, sensational ‘image’ of a product so that it sells. Right from underwear brands which promise extra ordinary powers to shampoos which claims to grow hair, beauty and confidence at the same time, there are myriad instances of overhyped, misleading advertisements, which shouldn’t have been aired. In fact, The Central Consumer Protection Council (CCPC) has observed that celebrities who are promoting such false and misleading advertisements are liable for legal action. Early this month we had reported that Advertising Standards Council of India (ASCI) has termed health and education ads to be most misleading & deceptive in nature, and cracked down on several of them. Fairness Cream advertisements, which promise instant glory and fame due to a whitening of skin leads the pack of such immoral, and false commercial propaganda. Infact, ASCI had to issue special guidelines for such Fairness Cream ads, considering how celebrities, both male and female, openly endorse them. Indian Government has constituted Consumer Protection Acts, and Government departments to deal with such misleading and false advertisements, and all consumers are encouraged to use them. Even if there is no monetary or health loss involved in such ads, there can be severe emotional and mental trauma associated with the portrayal of the ‘victim’. Take for instance Fairness Ads, where the visuals are created so as to impart an impression that girls who are not fair don’t get good jobs, husbands or a life. There are health products which claim to make children taller, hence more successful. Imagine the mental trauma a child encounters when he is teased for being short, a situation which solely arises due to such advertisements. Or for instance advertisements where a guy is magically able to attract beautiful girls after spraying deodorant on his body; these ads actually attack the evil social mentality and prejudices and exploit them to monetize it heavily. Consumer Protection Act, 1986 is an Act which has been made to help consumers deal with such false propaganda, solely designed to exploit human emotions and prejudices. Consumers can file their complaints by visiting the specific District level consumer courts, and in case their case is not being heard, they can approach State level and National level consumers courts as well. Here is the National Consumer Helpline Number: 1800-11-4000, which governs all these bodies, under Department of Consumer Affairs. Consumers can also visit ASCI, which is a self-regulatory body which takes up such cases of false and misleading advertisements. You can file a complaint right here. Don’t let brands fool you by playing with your fears and emotions – fight back! "Fed Up of Misleading & False Ads? 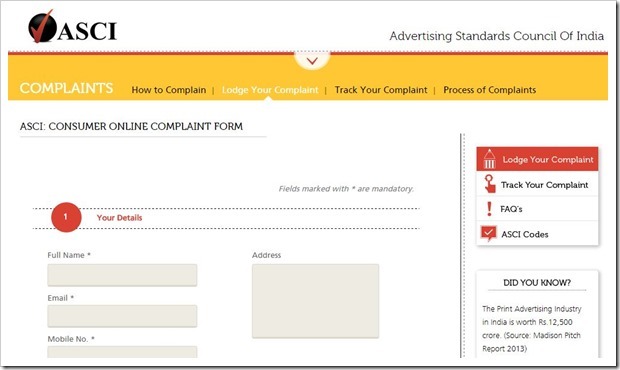 Now, You Can Stop Them By Filing Complaint Online", 5 out of 5 based on 3 ratings. Xiaomi Mi Note & Mi Note Pro Launched. Bigger & Better, But Not Cheap!